Publishing house of the Institute of Atmospheric Optics has been formed at the IAO SB RAS in 1996. Initially, it was organized for publication of the scientific journal Atmospheric and Oceanic Optics and research papers, written by IAO scientists. This is still its main activity, but additionally it issues a wide variety of printed products: from ordinary forms to artistic books, which harmoniously combine the high level of edition, design, and printing with the very attractive price-quality relationship. 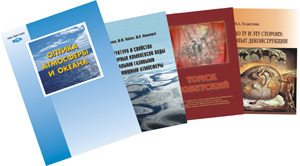 Every year the IAO publishing house issues about 10 books, including scientific monographs, belles-letters, journalistic books, memoirs, and student's textbooks, as well as conference proceedings, scientific journals, posters, booklets, etc.